Move vertically upwards over a straight line. Move sideways left or right on the wall which is accomplished through a diagonally guided horizontal motion. Shift itself from one wall to another perpendicular adjacent wall and detect roofs, corners and edges of a room. 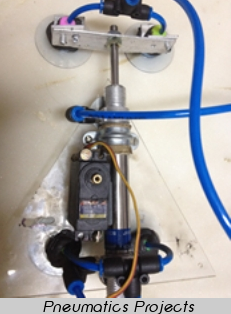 The robot is a 2 DOF open link mechanism which has 2 suction grippers, one at each end. Gripping of the robot to the wall was achieved using suction cups (Vacuum based grippers) which are industrially used for handling a wide variety of materials during automated manufacturing. The joints of the robot are driven by DC motors. in finding It truly useful & it helped me out much. I’m hoping to present one thing again and aid others like you helped me. Can i know the detail of motor used in wall climbing robot v2.0 ? 10 RPM, 12V, 45 kg-cm stall torque Side Shaft 37mm Diameter High Performance DC Gear Motor. I read this paragraph completely on the topic of the difference of most up-to-date and previous technologies, it’s amazing article. Hey There. I found your blog using msn. This Hey There. I found your blog using msn. This is an extremely well written article. I will be sure to bookmark it and return to read more of your useful info. Thanks for the post. I’ll definitely return. can u please send me video of making of wall climbing robot. What mirco-controller did you use for the Wall climbing Bot version 2.0 ? We used arduino uno board for the Wall climbing Bot version 2.0. Is there any documentation of this project (2.0 Version), I am really interested in learning from it. i found it interesting and go an idea for my project but for doing that i need some details like how its working and all the material required so can you help me with providing some details.